King of Swords advises authority – a focused, determined, intentional mind filled with clarity of purpose and strong will which offers excellent counsel and is most reliable. The state of mind that contains no doubt, is committed to intellectual honesty and the need to put knowledge into practice. A master of wisdom compelling others to recognize and hold to the truth. You may be provided with new opportunities that will take you in a new direction. Allow new ideas, new thoughts in with no judgment or censorship. Each new moment creates an opportunity to fulfill ever – changing needs. Formulate your ideas into workable solutions, apply your thoughts and make sure they work. Move forward – go for it! Mental, assertive, a perfectionist. Defender/protector, philosophical, studious, alert, direct – a knowledgeable leader. Tactician, soldier, father of ideas and ideals. Good planner. Ruled by the drive of necessity. Pilot, teacher, mentor, researcher – highly informed and courageous. In the first position: Defender to be sure, but also you are strategically involved in the determination of the value of things, in helping decide what is to be protected and worth saving, not just for now but for posterity. In the second position: You have someone, a family member, a partner, an angel that you can fall back on. And this shoulder is one who can help you think your way out of a problem as well as fight your way out. In the third position: Think well on this card, for he is coming to you in one guise or another. For there is order to be put in your mental house, to take charge and make things right. more leadership and control is needed here. In the forth position – Imprints of a protective and knowledgeable father figure which you admire. 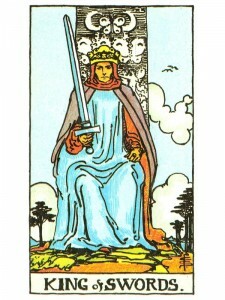 In the fifth position: The King of Swords is what you are thinking of at present, either in his person or what he represents. You are taking a stand, having staked out your position. This is your mind at its best, highly rational and well – centered. In the sixth position: Here comes a mature masculine influence in your near future and of course it may be delivered in person. As a result you will be more focused and purposeful in your emotional affairs and your creative projects can flourish with such intelligent supervision and assertiveness. In the seventh position: Here on the mental horizon in the near future comes power with a mind to direct it. This can be someone, a confidant with whom you can work toward your goals. Now is the time to assert the leadership and authority to get things done the way you think best. In the eighth position: Perhaps the king has been invited to dinner or to join you at work. Whatever, things are very much in control in your Physical/material Plane. This bodes well for the continued advancement of your ideas and goals. You are ready for action. In the ninth position: The heart is on this King of the mind. He may be an object of your affection or the centerpiece of a creative project underway. In the tenth position: Here is the support, the energy and resources that you need to secure your Mental Plane and it may well come in the physical personage of the King of Swords. It may, however, be the access to what he represents. Now is the time; you must pull Excalibur from the rock, let it teach you and you will use it well.